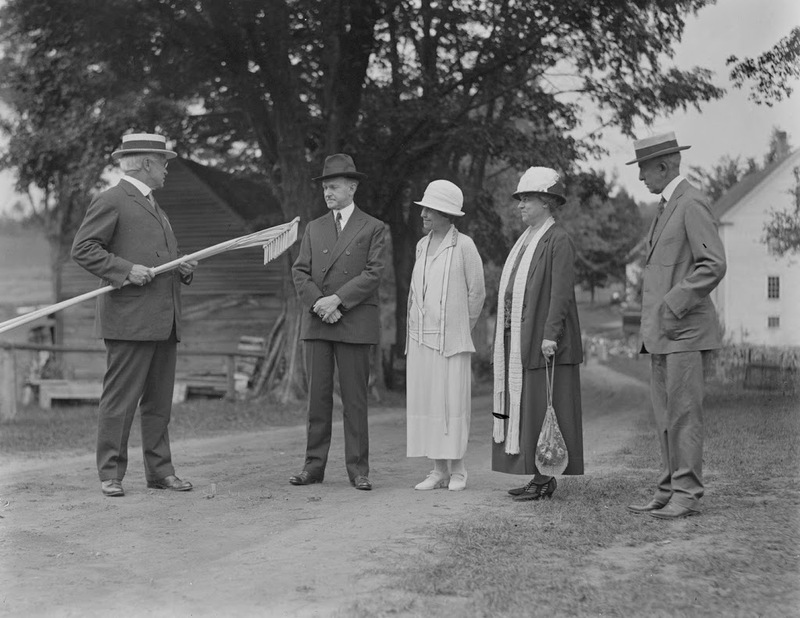 Congressman Allen T. Treadway presenting two rakes to President Calvin Coolidge at the Coolidge Homestead in Plymouth, Vermont on August 19, 1924. 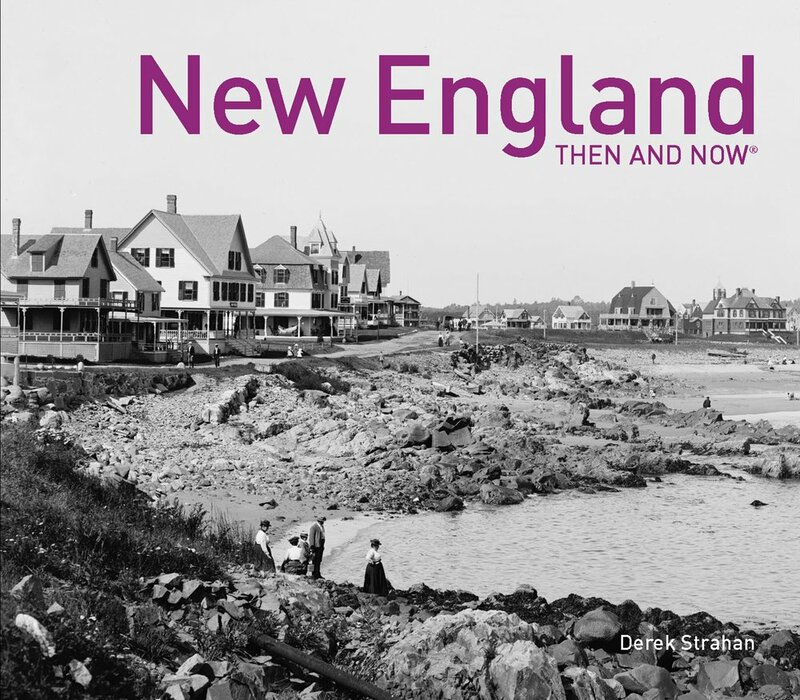 Photo courtesy of Boston Public Library, Leslie Jones Collection. I’m not quite sure what’s going on in this first scene. I understand that Congressman Allen Treadway is giving two hand-carved rakes to President Coolidge, but I’m not entirely sure why. Film of this ceremony can be seen at the beginning of this video. 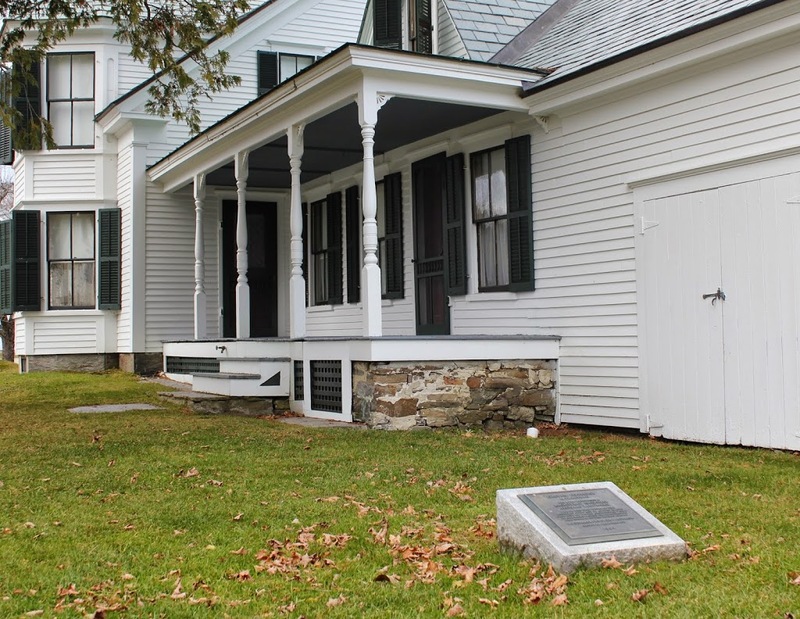 Congressman Treadway represented the First Massachusetts District from 1913 until 1945, and before that he was the President of the Massachusetts Senate from 1909-1911, three years before Coolidge himself would hold the same position. 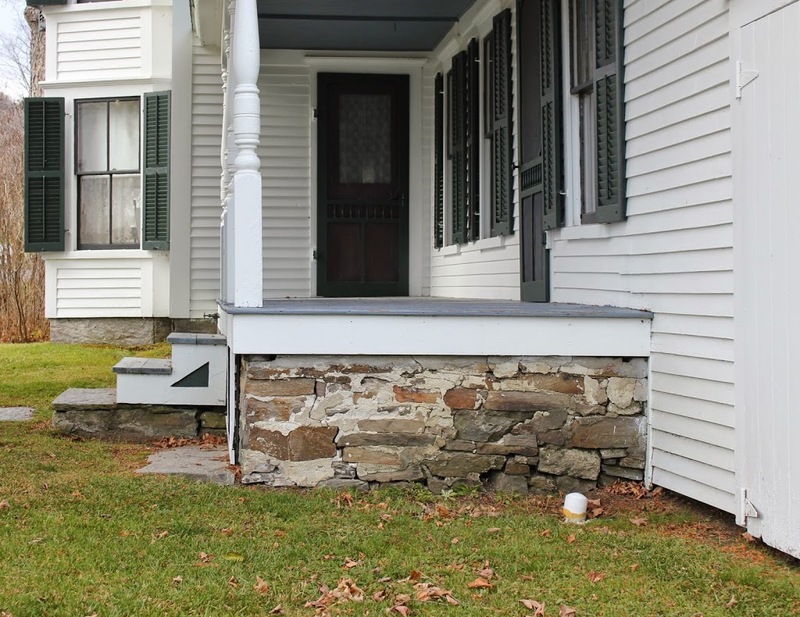 They never actually served together in the Senate; Treadway left just before Coolidge started, but like Coolidge he was a Republican from Massachusetts and fellow graduate of Amherst College. 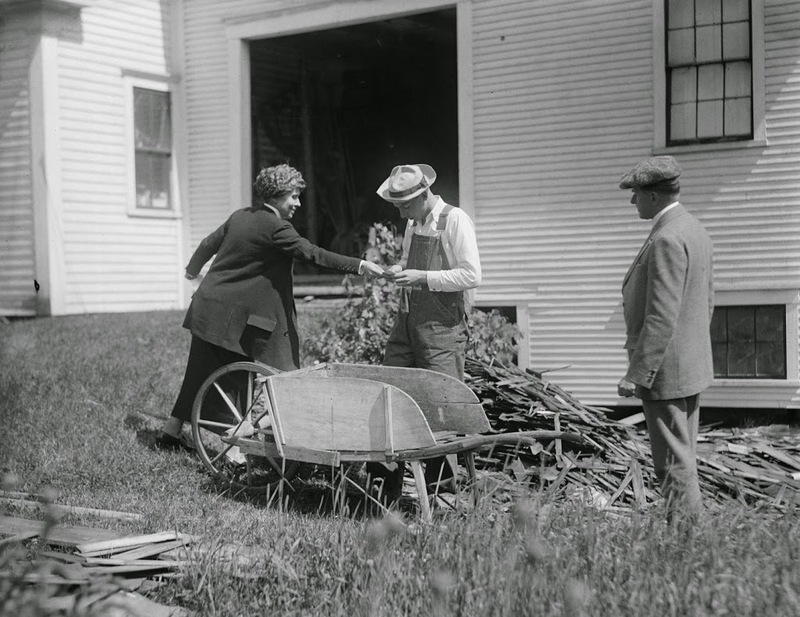 Calvin, Grace, and John Coolidge at the Coolidge Homestead in Plymouth, Vermont, probably in August, 1924. 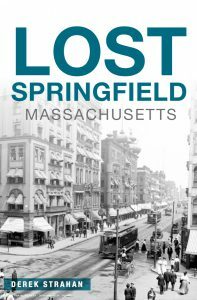 Photo courtesy of Boston Public Library, Leslie Jones Collection. 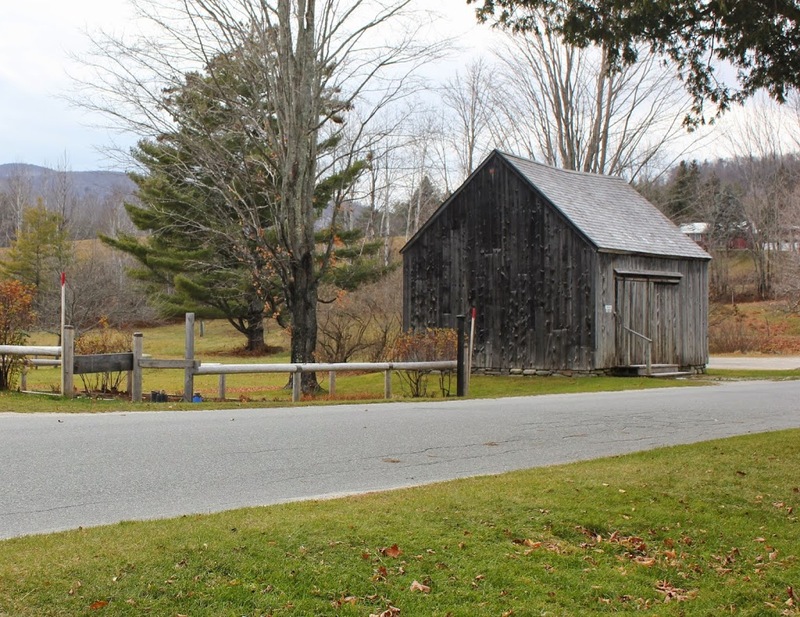 In the 1924 scene, President Calvin Coolidge and First Lady Grace Coolidge are walking toward their car, with their son John walking behind them. It’s the same car as the one in this post, but it doesn’t appear to be taken at the same time as that one, since all of them are wearing different clothing. I don’t know where they are heading, but probably not anywhere too formal, given that John is wearing overalls. 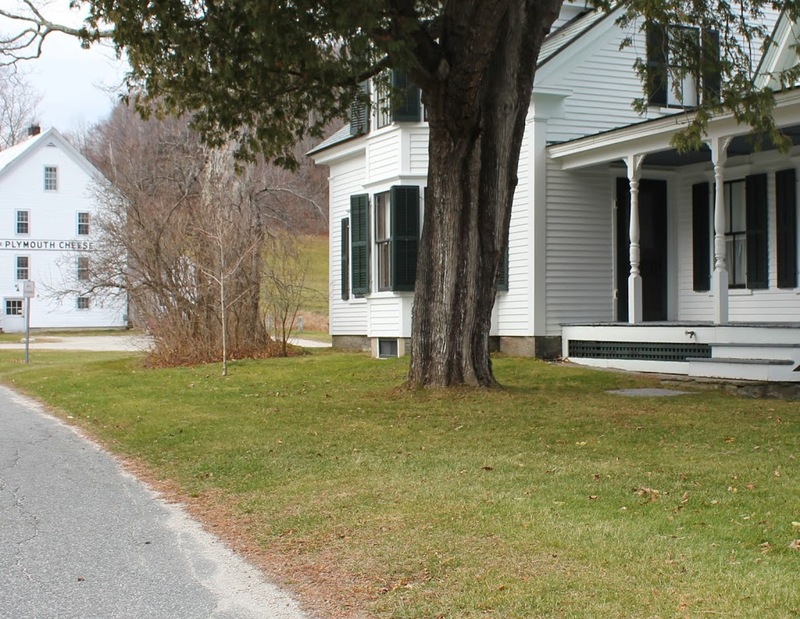 Today, the scene hasn’t changed much, although sadly there are no antique cars parked in front of the house anymore. 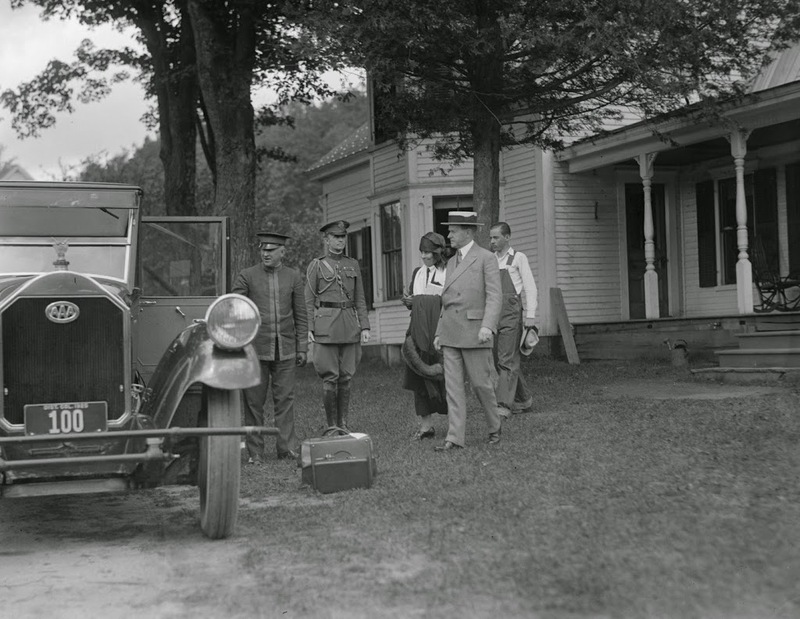 Grace, John, and Calvin Coolidge at the Coolidge Homestead in Plymouth, Vermont, probably in August, 1924. Photo courtesy of Boston Public Library, Leslie Jones Collection. The 1924 photo in this post was probably taken at about the same time as this one, when John Coolidge (center) was stacking kindling at his grandfather’s farm in Plymouth, Vermont. Standing on either side of him are his parents, Calvin and Grace Coolidge. 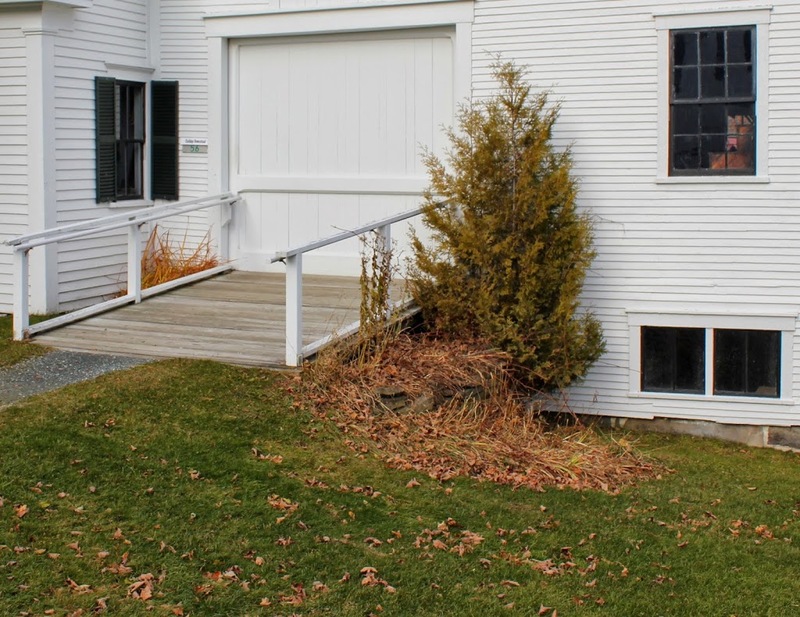 Today, the barn doesn’t look much different, aside from the ramp leading up to the door. 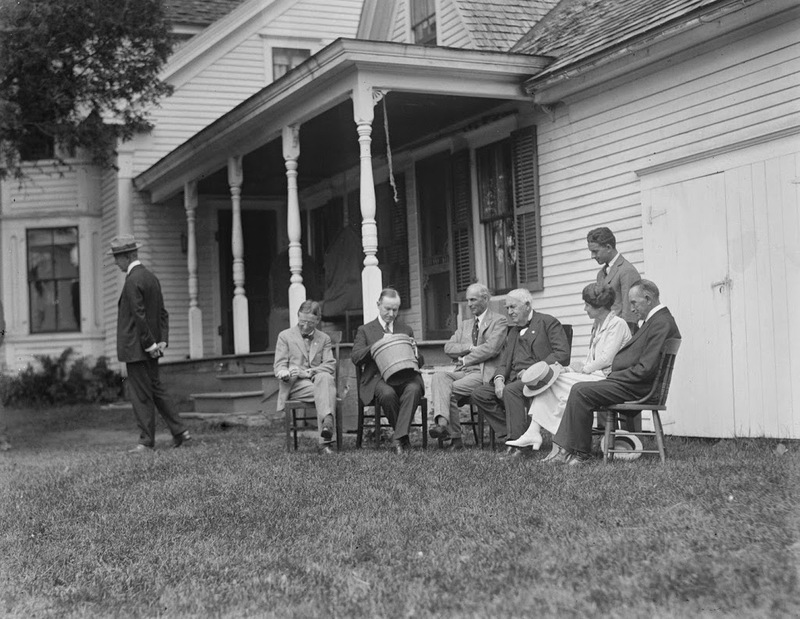 From left to right, John Calvin Coolidge, Sr. (President Coolidge’s father), President Calvin Coolidge, a bucket, Henry Ford, and Thomas Edison, at the Coolidge Homestead in Plymouth, Vermont, on August 19, 1924. Photo courtesy of Boston Public Library, Leslie Jones Collection. 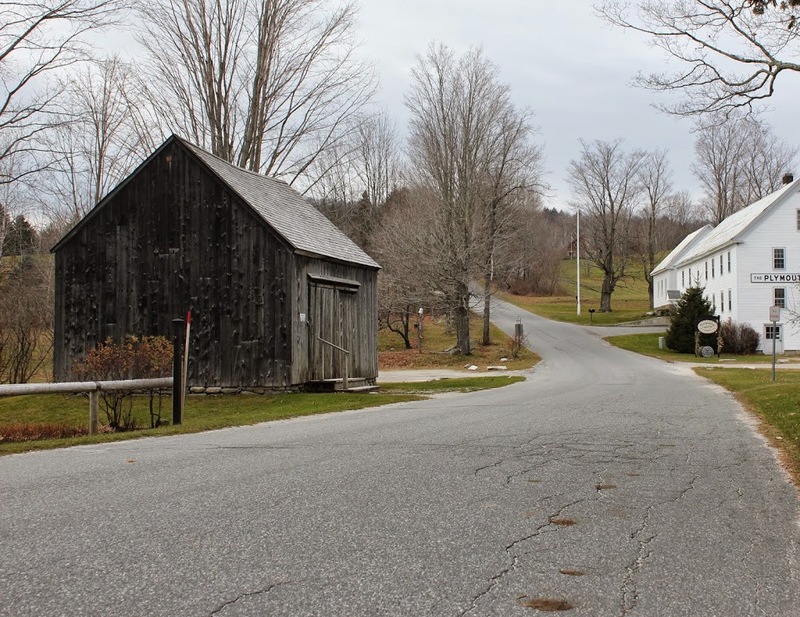 As mentioned in this post, three industrial giants of the early 20th century stopped in Plymouth, Vermont in August 1924 to visit the president. Henry Ford, Thomas Edison, and Harvey Firestone (not pictured) were traveling around the country on a camping trip, using cars to travel from place to place to promote the many recreational opportunities that cars provided. 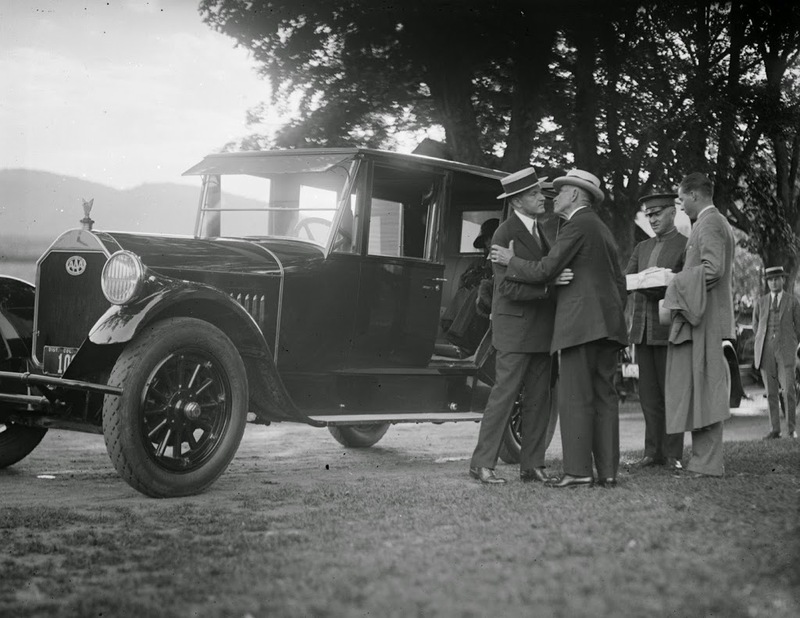 During their brief stay in Plymouth, Coolidge presented Ford with a sap bucket that had belonged to his great-great grandfather; the presentation ceremony was recorded in the photo above, and also in this film, starting at about the 3:18 mark. President Calvin Coolidge sits with some notable guests at the Coolidge home in Plymouth, Vermont on August 19, 1924. Photo courtesy of Boston Public Library, Leslie Jones Collection. In the early 1920s, automobile ownership was starting to increase among the American public, in part because of the marketing tactics of some of the men in the 1924 photo. Seated from left to right are Harvey Firestone (yes, that Firestone), Calvin Coolidge, Henry Ford, Thomas Edison, Grace Coolidge, and John Calvin Coolidge, Sr. Standing behind Mrs. Coolidge is Russell Firestone. For the past 10 years, Edison, Ford, and the Firestones had been taking camping trips across the country to publicize recreational use of automobiles. During one such trip in August 1924, the industrial giants stopped at Plymouth to visit the president, and although they only stayed for an hour, the journalists covering the president’s vacation made the most of it, photographing the group in front of the Coolidge Homestead. 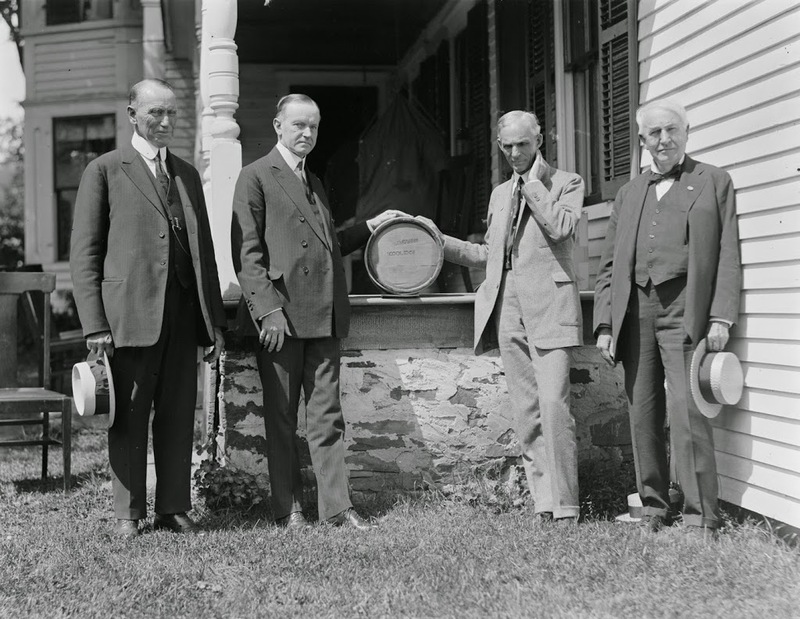 While the guests were there, President Coolidge gave Henry Ford a gift: a sap bucket that had belonged to his great-great grandfather. He signed his name on the bottom of the bucket, which is what he appears to be doing in this photo. Footage of this ceremony can be seen starting at about the 1:45 mark of this film. President Coolidge saying goodbye to his father at his home in Plymouth, Vermont, in August 1924. Photo courtesy of Boston Public Library, Leslie Jones Collection. The 1924 photo in this post shows Coolidge arriving at his father’s farm, and this one appears to be of him preparing to leave and head back to Washington. If you look closely, the car has a Washington, DC license plate, which is interesting because I can’t imagine Coolidge would have taken the car all the way back to the White House, given the poor quality of the nation’s roads in pre-Interstate days. Most likely, Coolidge would ride in this car to the nearest train station (Ludlow, perhaps? ), and then the car would be carried on the train back to DC. Also visible in this photo is Grace Coolidge, who is already seated in the car, and their son John, who is standing behind his grandfather and appears to be looking at whatever the uniformed man is holding.